HIGH STRENGTH THYROID SUPPORT – Those suffering from an underactive thyroid can have many symptoms associated with a slow metabolism including weight gain, depression, poor sleep, and forgetfulness. ThyroAid is an all-natural supplement that supports energy levels and promotes a sense of overall well-being. NATURAL VITAMIN & HERBAL REMEDY – ThyroAid supports in two ways, not only supporting the thyroid, but also supports body functions that contribute to a general sense of well-being. Having several different components such as Kelp (iodine), Ashwaganda, L-tyrosine and Schizandra, it is a natural combination that can help give you more energy and also keep body balance. MORE THAN JUST A THYROID SUPPLEMENT – ThyroAid supports thyroid function and hormone synthesis with essential nutrients to encourage healthy metabolism and weight management. Boosting your metabolism reduces weight gain and promotes weight-loss, increases energy levels and improves concentration. BEST VALUE THYROID FORMULA – Real support without unwanted side effects – other products may cost less, but they’re also less effective! They contain fewer ingredients or lessen the quality and cheapen the product. Do yourself a favour and start with the BEST. – Do you struggle to lose weight due to a sluggish metabolism? – Do you feel tired, dull and depressed? – Do you suffer from muscle aches or joint pain? – Do you feel cold when everyone else is warm? – Do you feel forgetful, lethargic or fatigued? If you answered YES to any of those questions you may be suffering from an under active Thyroid gland. ThyroAid is scientifically formulated to support these natural functions as well asmaintain within the normal range. . With Kelp (Iodine), Bladderwrack and Tyrosine which play critical roles in the natural support of Thyroid hormones and Ashwaganda and Schizandra for thyroid function support. ThyroAid is designed to support a healthy thyroid gland, immune function, and ward-off fatigue related to thyroid function in the low end of normal range. ThyroAid is formulated to stop weight gain and promote weight loss by encouraging a sluggish metabolism maintain a normal range and promote an overall sense of overall well-being and mood enhancement. Click the ‘Add to cart’ button now to support healthy thyroid function and promote an overall sense of overall well-being today. 14 SUPER ACTIVE INGREDIENTS. 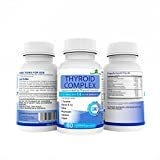 Thyroid Complex contains L-Tyrosine, Iodine, Vitamin B12, Selenium, Kelp and Magnesium to give your thyroid MAXIMUM support, encourage a HEALTHY METABOLISM and WEIGHT MANAGEMENT. COMPLEX FORMULA Don’t be deficient in those important minerals and nutrients, make sure you give yourself the best chance of maintaining a healthy thyroid with Thyroid Complex. OUR BEST LAB TESTED FORMULA OF THYROID COMPLEX supplements are of a high quality, professionally developed formula and may help you maximise these benefits. Can assist/boost your glands and glandular functions. THYROID COMPLEX with 14 active ingredients contains l-tyrosine, iodine, vitamin b12, selenium, kelp and magnesium to support thyroid function. Can support symptoms of an under active thyroid gland as well as supporting a healthy and faster metabolism and increasing your energy. • L-TYROSINE- Tyrosine is involved in so many vital functions that it is considered to be an all purpose amino acid. Essentially it is necessary for the manufacture of thyroid hormones. The body tries to manage and balance the level of Tyrosine, depending on your life circumstances. High levels of stress on a daily basis may result in the depletion of Tyrosine from your body. By increasing the amount of L-Tyrosine in your body it can indirectly help reduce stress. • SELENIUM- Several research studies have demonstrated the benefits of selenium supplementation in treating auto immune thyroid conditions. • IODINE- is an element that is needed for the production of thyroid hormone. Our bodies do not produce Iodine naturally, so it is an essential part of our diet. Lack of Iodine in the body can prevent/ slow down the Thyroid hormone, Thus, iodine deficiency can lead to enlargement of the thyroid, known as hypothyroidism. • MAGNESIUM- deficiencies are common, especially in well-developed countries where processed foods are so common. Many of us can likely have a magnesium deficiency, which can lead to an underactive thyroid (hypothyroidism).